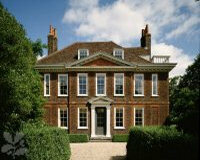 Description: Fenton House was built in the late 17th century by a master builder for a successful local merchant. Thomas Sympson was the first owner whose widow sold the house to Joshua Gee (1667-1730). Gee was a merchant in silk, iron and other commodities and also an adviser to the Board of Trade and Plantations. The second recorded owner, he bought Fenton House in 1706, and was a founding partner with George Washington's father in the Principio Company which was formed to produce pig iron in Maryland USA for sale in England. A Quaker and a personal friend of William Penn, (Pennsylvania is named after him) he was one of eight men who procured Penn's release after he had been imprisoned for his steward's dishonesty. The mementoes of Joshua Gee's ownership of Fenton House are his initials and those of his wife (JAG) entwined in the ironwork over the front gate. The gates are of unusually high quality made by a craftsman working under Jean Tijou. More unusual, though, is the 300-year-old orchard where some 30 varieties of English apple are grown. You can sample the old varieties on Apple Day, in September. 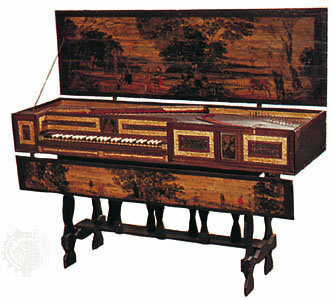 The most prominent feature of Fenton House is not its undoubtedly fine architecture, it is the collection of early keyboard instruments. The collection was amassed by Major Benton Fletcher, and includes clavichords, spinets, pianos, harpsichords, and other early keyboards. Far from being museum pieces, the keyboards are all in playing order, and music students may play them if they can first pass an audition. In addition to the keyboards, Fenton House features collections of fine porcelain, including Chinese, Japanese, and European figures.